The SCSI Trade Association (STA) was established in 1996 to provide a focal point for members to communicate the benefits of SCSI to the industry. STA promotes the understanding and use of Serial Attached SCSI (SAS) technology and influences the evolution of SCSI standards to meet future industry needs. For more information, please visit the STA web site at www.scsita.org. Serial Attached SCSI (SAS) has been the storage technology of choice for business-critical applications in data centers for nearly 15 years, starting with 3.0 Gb/s SAS in 2004, then doubling in effective bandwidth with each new generation. The next generation in development is 24G SAS, with end-user products anticipated in late 2020. Optimized for both solid state drives (SSDs) and hard disk drives (HDDs), 24G SAS is backward compatible with existing tried-and-true SAS ecosystems. The end result is unmatched by other storage technology: a highly scalable and flexible technology, offering the fastest per lane performance with the most reliable device management of any drive technology available. 24G SAS will be the technology of choice for all-flash deployments, as well as tiered or cached systems supporting both HDD and SSD devices. Join this webinar to learn more about how 24G SAS technology can satisfy the performance, scalability and capacity required by today’s video streaming, big data, analytics and other business applications. SAS technology can be deployed across multiple storage tiers and supports SSDs with varied endurance and performance levels, as well as low-cost capacity storage. Many enterprises choose Serial Attached SCSI (SAS) for storage in the data center, and for very good reasons. The price/performance point exceeds all other solutions in the market, and the ability to scale with SAS to potentially thousands of drives is simply unmatched. These benefits of SAS are all realized while maintaining high reliability, ease of storage management and the ability to address power management needs in the data center. At the conclusion of the webinar, you understand why, from large to small data centers, SAS is the better storage protocol solution. SAS (Serial Attached SCSI) doubles in speed with the release of each new generation. The newest speed bump is 24G SAS, with end-user products anticipated in 2019. In addition to effectively doubling the speed from the current 12Gb/s SAS, 24G SAS has optimizations for both SSD and HDD. The end result is a highly scalable, highly flexible technology that optimizes use of the storage devices released today. 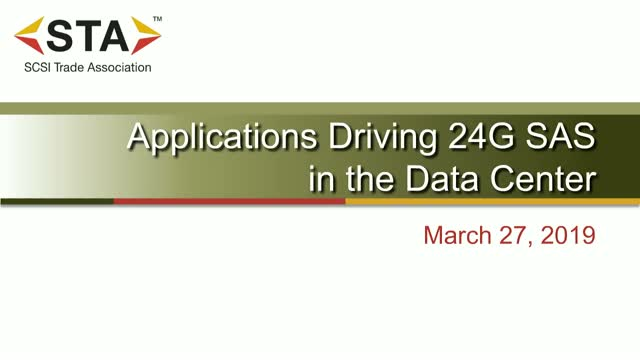 This presentation provides an overview of why 24G SAS will be the protocol of choice for all-flash deployments, data centers, as well as tiered or cached systems with both HDD and SSD components.